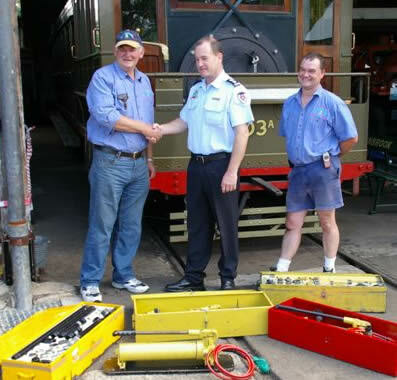 Rail boost: Ted Mullett of the Valley Heights Locomotive Deport Heritage Museum (left) thanks Bruce Cameron of the NSW Fire Brigades fror the donated rescue equipment while museum volunteer and NSW Fire Brigades officer Phil Pedley (far right) looks on. The Valley Heights Locomotive Depot Heritage Museum got a lift from the New South Wales Fire Brigades this month—literally. The brigade's rescue section donated four sets of hydraulic rescue equipment to the museum on Wednesday January 16. The donated equipment is surplus to the Brigades needs and has been replaced by 'state of the art' rescue equipment on operational fire engines. "The NSW Fire Brigades and the Valley Heights rail museum have enjoyed a working relationship over many years with the Brigades, utilising the Rail Museum as a training ground for incidents and rescues involving railways," said Station Officer Bruce Cameron. The Rail Museum will use the hydraulic equipment for repairs and maintenance at the Museum on rail infrastructure and rolling stock. Museum spokesman Ted Mullett said the museum was very grateful to the NSW Fire Brigades for the donation. The rail museum in Tusculum Road is open the first and third Sunday of the month. Page Updated: Wednesday, 07-Nov-2018 13:33:38 PST.